Wow, that Spydeco Ikuchi is looking nice. 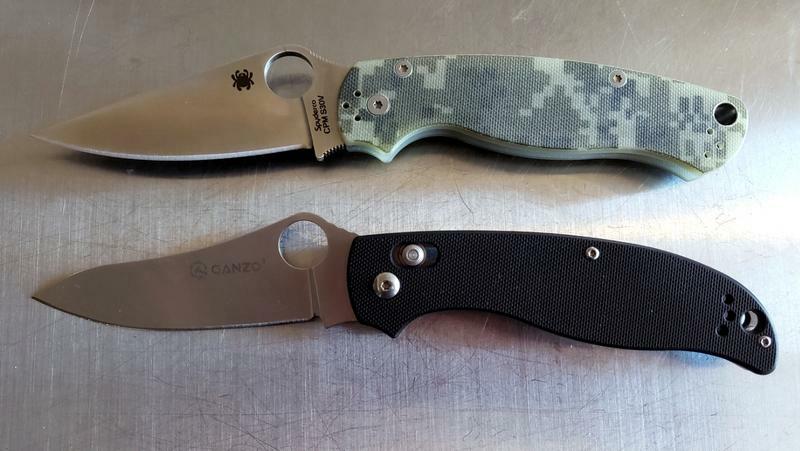 I’d definitely buy the Ganzo version of that. Looks like another winner from Kershaw. I like how the handle is a different color than the rest of my knives. This one was a bit of a gamble as there are few reviews online for this newish model. 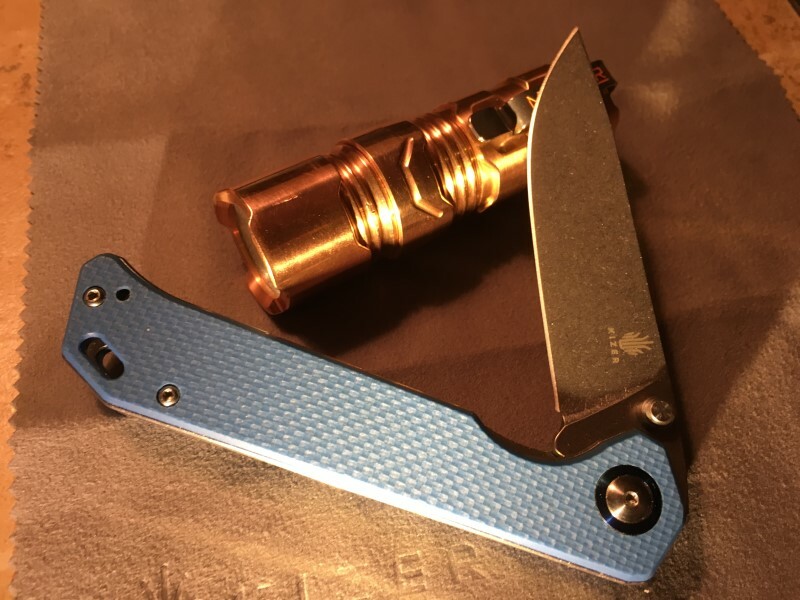 I carried a kershaw for a few years when i was young in the mid 80ties, it was a quite expensive knife, but in my case it fell of a truck as most things did back then. 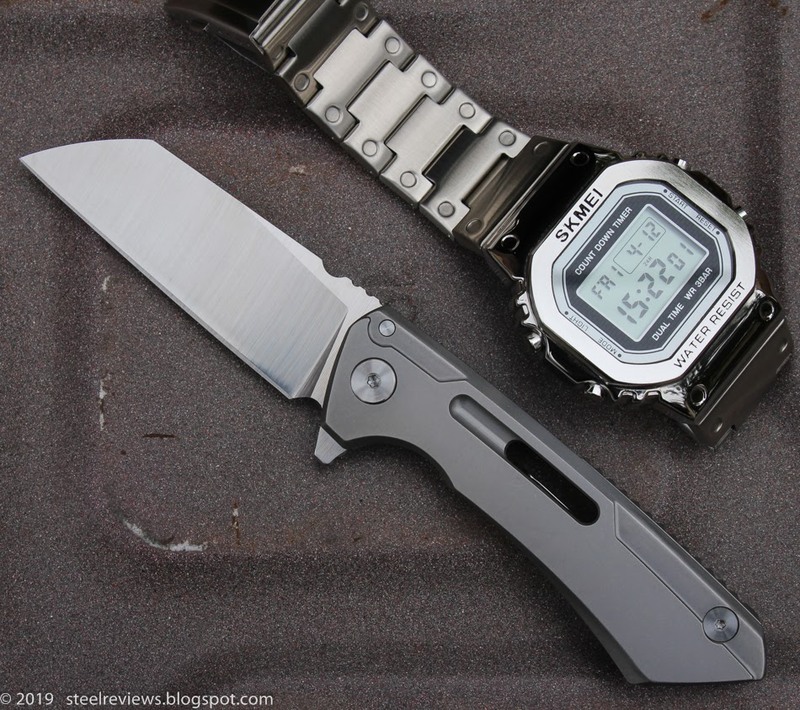 Kershaw folders and Puma fixed blade was the order of the day back then. The heat treatment is the thing too. Tojiro and MOST True genuine bladeshiths guard their H’T with a large safe. Chuckle. layer Tojiro DP and Laminate 17/33. Iseya 33 lam, or Basic Misoni Swedish. They’ll give you what you want. with spades, once you get the hang of edging them. 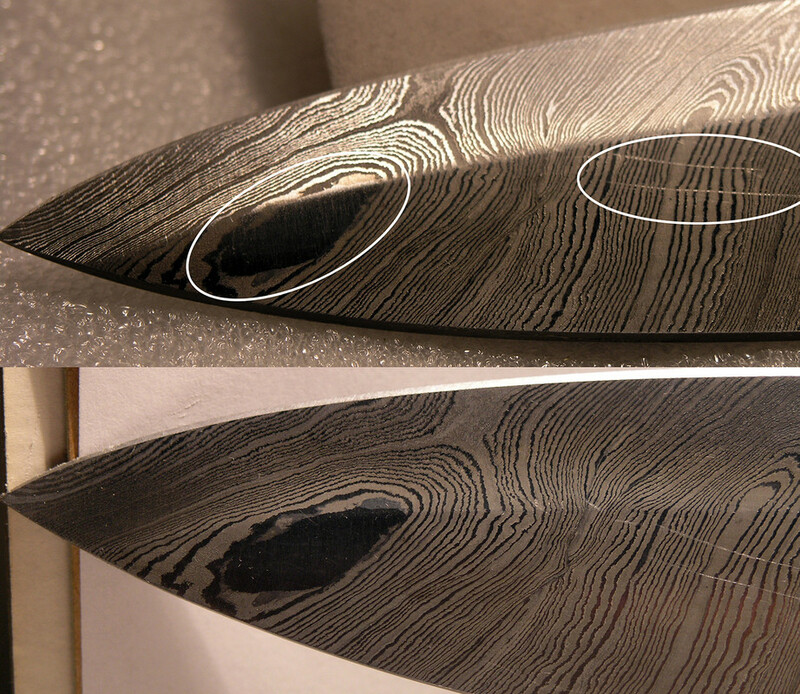 Japanese blades tend to chop rather than rock. Forefinger and Thumb ON blade grip not ALL hand on handle. and Santoku 7inch “I” find the most comfortable of all. Wusthof Chef 8in for heavy. 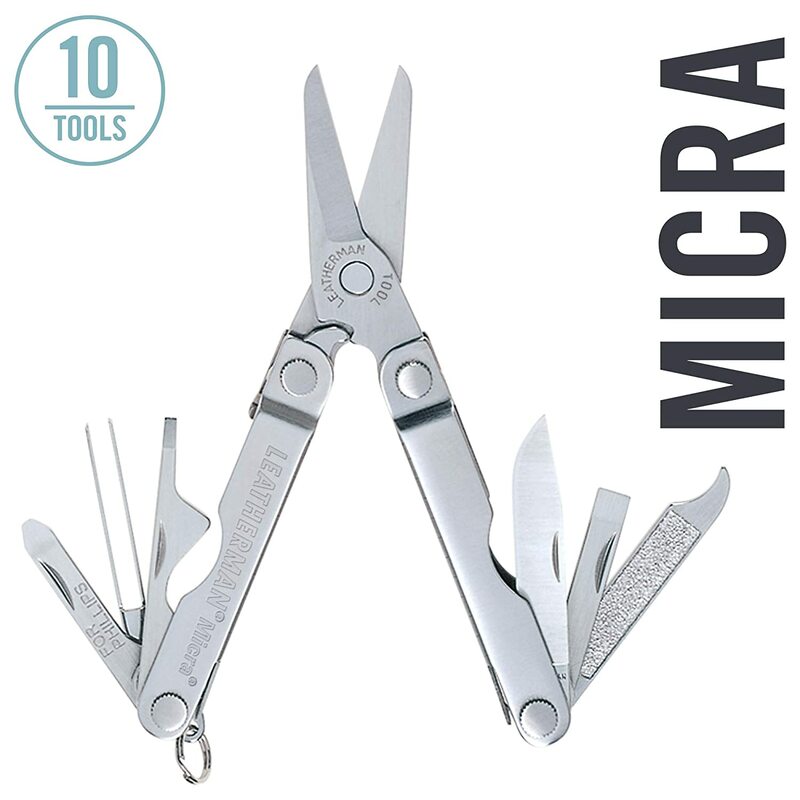 with 6 in Petty, either of above mfg,for easy general use. Those three. Paring and a 10in HEAVY Meatworks butchers blade. It’s blade tip, tip up. Slow ground down to make level spine. My go to for ALL really heavy, and pumpkin type cutting. Learn to sharpen/steel ‘em and you’ll always shave the hairs on the hairs on your arms. For home meal family sizes. Some like longer blades. I prefer comfort and maneuverability in mine over commercial length. They really ARE a new style of food prep and knife handling quality. with around $65 to $150ish covering the cost of all blades you’ll need under 7 or 8 inches from above mfg’s at Hocho. I’ve been prepping my food for over 60 yrs. Mainly Vegetarian. and the last 6 or 7 ish yrs with the Japanese style is a real eye opener as to how…. The late model Slim blade Wusthof 8in chef are a nice blade. Those Calphalon? Santoku are I believe, Chinese assembled with cheaper Japanese type steel. After you try a proper Japanese blade, you’ll see what I mean. Apart from some American custom Blades copied from Japanese style I don’t think you’ll find sharper anywhere. Here ya go, $24.60, not too shabby. Thank you for the link, I have one headed my way. My FH11-CF-D2 arrived yesterday & I like it just fine. Well built & very good fit n’ finish. Super fast shipping too. You might want to keep an eye on this Gocomma Folding Knife – Black ar Gearbest. They are actually built more heavy duty than the FH11. The liners are a much thicker stainless & the fit n’ finish is excellent. They are bumping $40 atm , but on a Flash Sale I have bought them for anywhere from $8.99 to $16.99. If your interested, watch out for another Flash Sale & a lower price. They are well wort the money ……. Thanks for the tip on that rose pattern on VG10 statement — makes it suspicious, and positive reviews likely from clueless buyers. I took a chance on a hand made knife from Canada that’ll be here next week. Seller has 100% feedback with over 20,000 transactions. So I’m hopeful it’ll be a good knife (not expecting top quality but decent). Thank you. I will keep an eye on that one. I seen it a while back for pretty cheap but didn’t jump on it. I will check on it once in a while and see if I can get a good deal on one. Your welcome. I’ll try & keep check on it too for a cheaper price & let you know if I see it. I am gonna get some more for gifts if/when the price gets right again. It’s a very good knife…..
You May be lucky with that one. But the Steel itself.is not the be all. It’s the heat treatment and rolling that makes them. Never used Jap b4. they feel like magic. For a while. 200 layers of real steel with a reasonable Smith would cost you a starting price of $250+. There are a zillion Chinese and otherwise (European.Eastern) MFG’s, retailers nowadays. ALL flashy, multi layer blades. but ALL built to their price. Not the quality. Some look beautiful. as desired. Do yourself a favour. For Western steel and cutting knives. They the ones I’ve stuck to over the yrs. There are others preferred by others too. The Shun. Global etc, are Western Japanese blades. Exxy and niice looking. but for same $$‘s you can get much better quality .feel. cutting. Actual true Japanese blades. real one. Next to actually going there yourself. They have 6 months PLUS. of information on Japanese. Steel. Knives. Knife makers and how to sharpen. 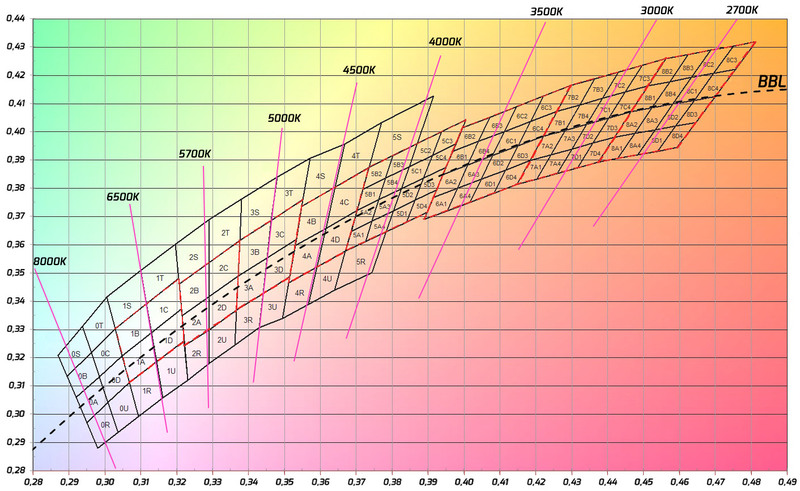 Use, and maintain the different steels. With a decent grading on the Bladesmiths in there too. With types of blade/Handle for EACH Cutting style. White or Blue Powder alloy blends give usually the best Carbon steel. You want a “cleaver” Go Chinese. You can go forever on these things. And you thought Folders gave an interest. They just the tip of it. Then Fixed. Then Real knives.. We have around 8 or 9 Kitchen knives here. Wife uses 2. Occasionally the 10 in. Me. I use 3 in the 3. 6. and 7in range. One Wusthof 8in Chef. 5 or 6in Petty and a 7in Santoku, or 6- 8in Chef. Some the 10+ inch. a $5 Paring. and maybe a H/Duty something or other for Pumpkins etc. I find Meatworks blades the best for that last job. Basic and reliable with decent. Hard working steel. (Mine cost $11 AUD Del. Now is $17 DEL). I’ve been through all the sharpening styles, Mostly. WET.Whet round etc. With a sliding rod system that gives even. Selected Angle, level face to cutting edges. You get a little fed up rubbing. rubbing. rubbing with wet hands after 50 odd yrs. GENTLE… With decent diamond. NEVER coarse. Done in fraction of time and “Almost (But never quite) a finished edge to match. I can press my blades against finger tips and draw blood without slicing. My strop.is a leather “3in x 3\8th “Donkey Pack Strap” I brought out of Army with me in early ’60’s. Oiled about 5 times so far. WAS 8ft long. Now. around 40inches. Too short for my belly now. I won’t touch a field knife without tang, and/or shaped handle grip with cut out for at least one finger. Been bitten too many times by narrow blade straight sided folders with wet/Bloody, etc hands. That Go Comma a nice little blade. But I’d be wiping a thin layer of clear Sikaflex down both scales to give a little more traction for your pinkies. BUT. I find the inside flicking rivet “nips” the first finger tip area when closing. Too close to handle, . OR too tall. I’m grinding mine down this arvo to try. I DO like the blade now. 753M Nipping. NOT the 733. Late night again. Yeah, I like Henckels and Wüsthof for most cutting, a Chinese cleaver for mooshing garlic and hacking through watermelon and the like. 10bux for the cleaver offa Amazon, best deal I got in a looooong time. Well I didn’t get to carry it today. I was at work when it hit the mail box, which subsequently got me into a interesting conversation with the wife. All I heard was blah blah blah, too many knives, blah blah blah, not enough jewlery, blah blah blah. I think I got her point though. She has recently gotten into collecting geodes. Totally not my area of expertise but, I will start my research. Kizer Begleiter. My first Kizer. I really like it. Buttery smooth, good lock up, wickedly sharp, not too fat but not to thin either. The clip is okay, a bit small and something you might see on a minimalistic gentleman’s knife but still has enough room to fit over a jean pocket without too much trouble. It’s a winner I think. Time will tell. Manker Timeback Cu helping to hold it up a bit. Thank you to TurboBB for parting with it. It’s a hefty, chunky little fella. rcwilly, you are killing me. Such great looking knives. I fall in love with the pictures of them then, I make the mistake of looking at the price. I’m buying a bunch of Powerball tickets this week. rcwilly, you are killing me. Such great looking knives. /\ . Me too!! … .. Sorry guys… I’m a bad influence. Even with the $100 off on this one I don’t think I’ll end up keeping it…but that milling sure is pretty! What is it? It sure is a beauty…. Thanks!! Sorry, I must have overlooked your previous post, my bad. I had to get away from knives for a few years because I was spending too much. So I have not kept up with most of the newer ones from Spyderco, Benchmade (my personal favorites) or anyone else really. But it appears, by some of the pics you post; that Spyderco has really upped their game over the last few years. The ones you have posted are nice!! Oh yeah… I replaced “Knives” with “Lights” those few years ago. That really helped a lot…. . Unfortunately I was not lucky. 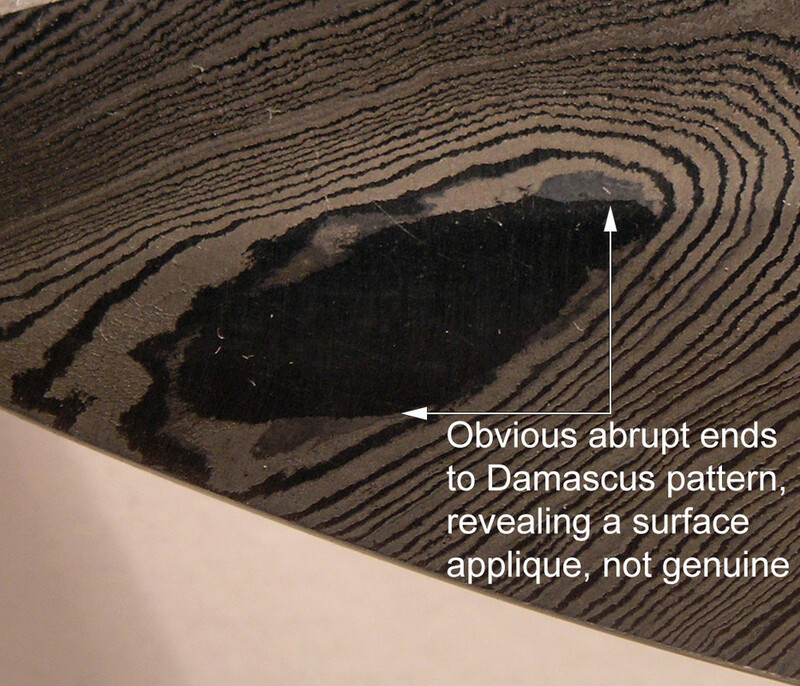 It was so bad that there was a “spot” where the Damascus pattern was obviously missing and breaking the pattern. As they say “you get what you pay for,” most of the time. Of course the auction photos showed a nice natural pattern of a “model” knife. The wooden handle is nice. The knife is a bit heavy… can’t say whether or not the steel is good quality. The edge came a little dull. I honed it and that helped. But my Calphalon Santoku feels better. Dragged the Ganzo FH31 out of hiding today. I was actually looking for something else and found this still in the box at the bottom of a drawer. No clue as to why I put it there. Nice little knife. Not as nice a rcwilly’s EDC knives but it will have to do. And that (unfortunately) is the way we all get experience. Hopefully you won’t get caught again. Just remember. TOP line knives. Damascus or otherwise. Will start around $850 and up to multiple thousands. Good. Mid range from a top name. $450 to $700. Tojiro. Iseya and others that YOU have read up on and talked about. Will start at around $65/80 and go up through different models to around $350 ISH. You will NOT Get cheap. Chinese cooks knives like you do Folders. (Size alone precludes that..) THAT ARE ANY GOOD EDGE WISE. Hundreds of yrs of Blade Quality skills don’t come cheap. 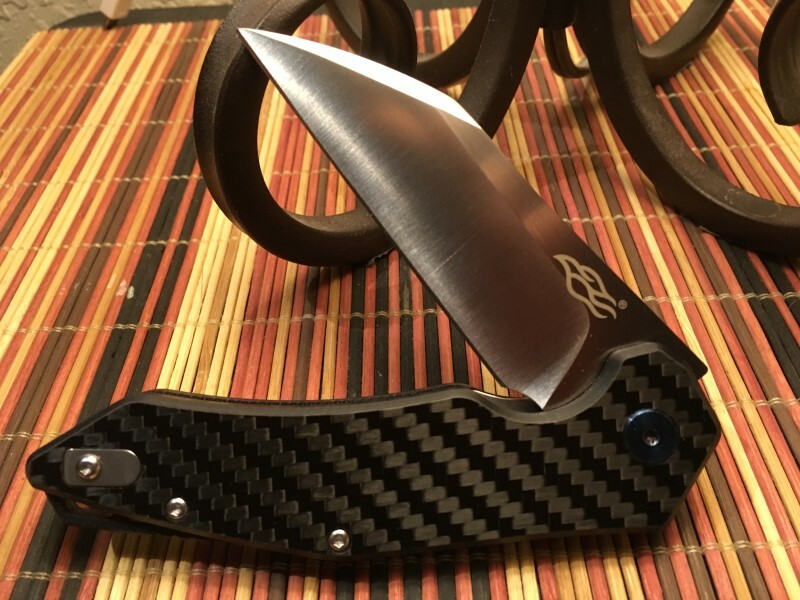 Accept that ONE good “speshul” knife will cost you $350 to 600. At your skill, experience levels. Just hold and drool on every now and then. for a half sensible price. And get the Tojiro, Iseya. etc From the Upper end of the lower/Mid range blades around $65/230. for your daily use. They WILL do a great job. And the likes of our blade skills. WE will NEVER know the difference. The Iseya are 1\2 a level UP on Tojiro. But NEED more care in handling. Use and are happy with results from Tojiro DP Blades. and the models above. Iseya I ser, 33 layer Hammered $85ish. Tojiro DP 7in Santoku $?? OR…..
Iseya 33, Damascus Santoku $??? With Any comfortable feeling $20 Paring for now. Look on net for Wusthof 8in Chef (Narrow blade) on special. But any decent Euro blade form will do for that. I like the Brazilian one. (Mundial) but it is soft steel. Wears quick. Feels good. Look in Hocho for prices PLUS freight added. And…. I think a local Meatworks supplier would be best for a 10/11in Butchers knife for any heavy work. Good blade, cheap price for minimal usage. with another $40/50 for meatworks blade. THEN… Start saving for the Drool item/s. A lot depends on your income. Slows you down a bit once you spent it all hey.